Absolutely beautiful Vector Arms 9mm Mini Uzi. This fully transferable submachine gun has seen very little use since it left the Vector Arms factory. Study the photograph. The only real wear is from the cocking handle as it slides on the top cover. 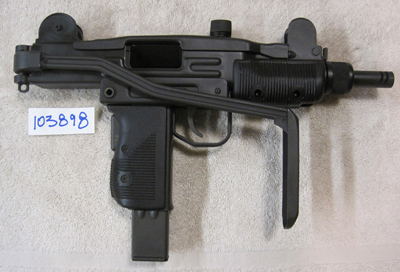 This is a registered receiver SMG, a real submachine gun from the start, not a semi-auto Uzi with a registered bolt. If you can afford to purchase a registered receiver Uzi, it is the best investment choice. We have test fired it and it shoots flawlessly. Are you seriously interested? Email your phone number and I will call in the evening with the gun in my lap and describe every detail. $8,450 If you are after a fully transferable Mini Uzi, this gun will prove very pleasing to you. It transfers to your dealer tax free. Thank you!